Galen has spent the past 10 years seeking adventure. 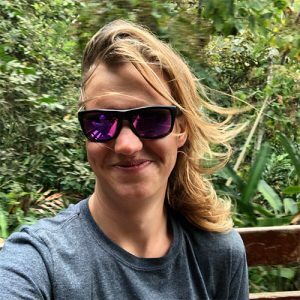 Skiing, commercial fishing, traveling, and creating laughter have been some of her various passionate pursuits before falling into Paragliding. It’s no surprise she is a natural teacher since both of her parents are outdoor educators. There are people who are meant to teach, and Galen certainly has the gift. Eagle is honored to have her on board. She was instrumental in getting the Eagle Shop off the ground. Galen is a regular at the shop and can be found on the sewing machine repairing wings, making lines, and handling repacks or laser trim tuning gliders. She is up at the lake towing pilots at the SIV clinics when not in Santa Barbara or traveling the world paragliding. Skills – Pilot Certification, Cross Country, Presentations, Glider and Line Repairs, Laser Trim Tuning, Reserve Repacks, Tow Technician.